we are engaged in providing a wide collection of marble designer vases to our clients, which is widely used for decorating interiors and exteriors. Our range of pots are crafted by our sculptors and artisans using high quality white marble. Furthermore, we also provide customized solution to our esteemed clients at industry leading prices. We offer an exclusive range of Exclusive Makrana Flower Pot With Gold Work On at unmatched quality and market leading prices. They are manufactured using advance and latest techniques. Our offered Exclusive Makrana Flower Pot With Gold Work On has long serving life and widely used in several other industrial sector. We are offering a wide range of Candle Stand that are used in various applications in residential as well as commercial purposes. These products are manufactured from quality marble obtained from trusted vendors. These are available in various natural colors, shapes and designs and highly durable and weather resistant. 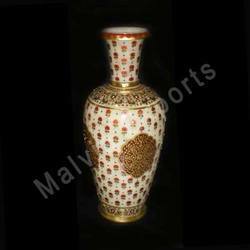 We offer you a classic piece of craftsmanship in the form of Gold Plating Marble Vase. These are beautifully carved and can be embellished as show piece in drawing rooms, garden and halls. These can also serve the purpose of keeping flower vases and enjoy the greenery. This is a perfect piece of architecture which can be used for home and garden decoration. 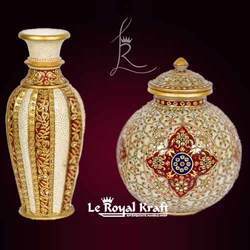 Decorative Marble Handcrafted with Kundan work Vase. We offer a wide range of hand crafted Marble Handicrates products.